One of the best things for me in being a part of TMS (The Mustard Seed) team is seeing many of you in the store and chatting about, of course, food. I am personally working my way around and up to and trying everything in the store (talk about fun). Let’s face it, word of mouth, is probably the best way to share about good food, good service received, just about anything. You try something, you like it, you get excited, you share. Simple. Today I tried a new product……………in my books it’s a little extreme but the two main ingredients are something I enjoy. Crazyhorse Wasabi Horseradish!!!!! If you’re thinking what I was thinking, wasabi AND horseradish together, whoa! Well, I am here to tell you, I survived! It was added in place of my favorite “summer veggie wrap spread” tzatziki. “a clean quick heat that fades very quickly and doesn’t keep burning”. 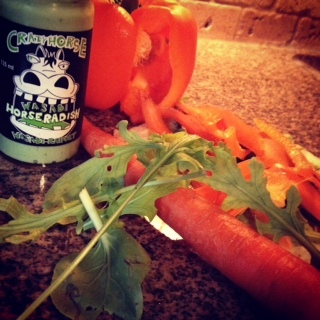 “WASABI HORSERADISH EXTRAORDINAIRE: ADD it to the list of SUPERFOODS!!!! Bold, brilliant and full of bang, wasabi horseradish is a superfood that is easily forgotten. Known for its ability to kick the snots out of any sinus cavity, did you know that it is also able to kill cancer cells, kill bacteria, viruses, fungi and all sorts of other little critters that don’t belong in our bodies!? !